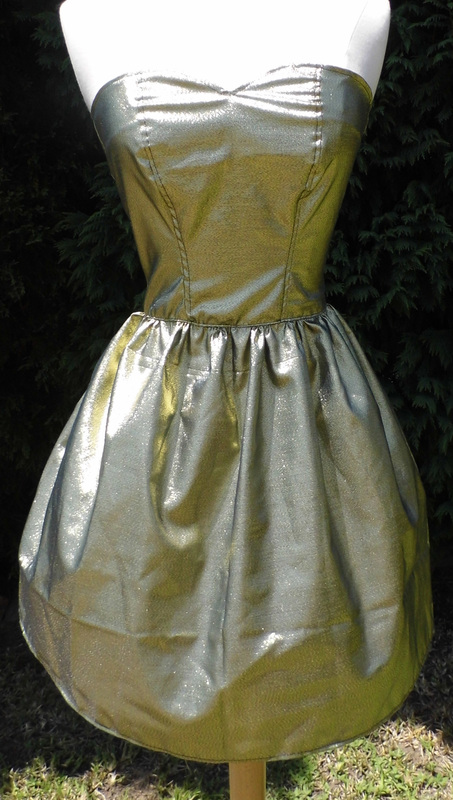 Here we have a size 10 Gold Party Dress with panelled bodice and gathered skirt ***AWesome****. 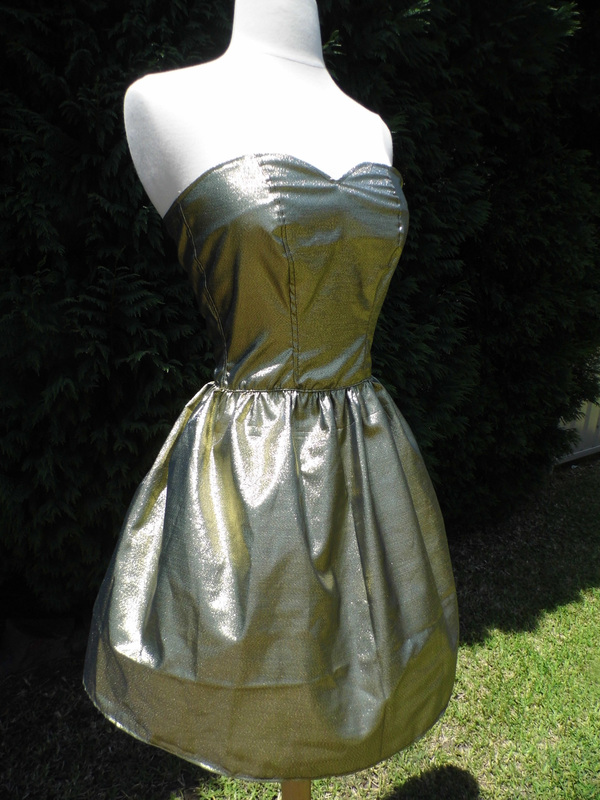 Made with Metallic fabric that is so shiny!!!! !You will be the blingiest sparkliest and prettiest girl at every party with this Secret Culture original. It is fitted to a standard size 10 so will only fit a girl that is a perfect 10.If you are larger or smaller you will have to be fitted by a dressmaker to ensure that the dress maintains that perfect figure hugging silhouette.With the bust if you are smaller or larger you can always wear sticky cups to make your bust size increase to fit.If your hips are larger this won’t make a huge difference as the skirt is gathered and so will flare out around you. This is design 7 of Secret Cultures 50 designs in 50 days challenge! 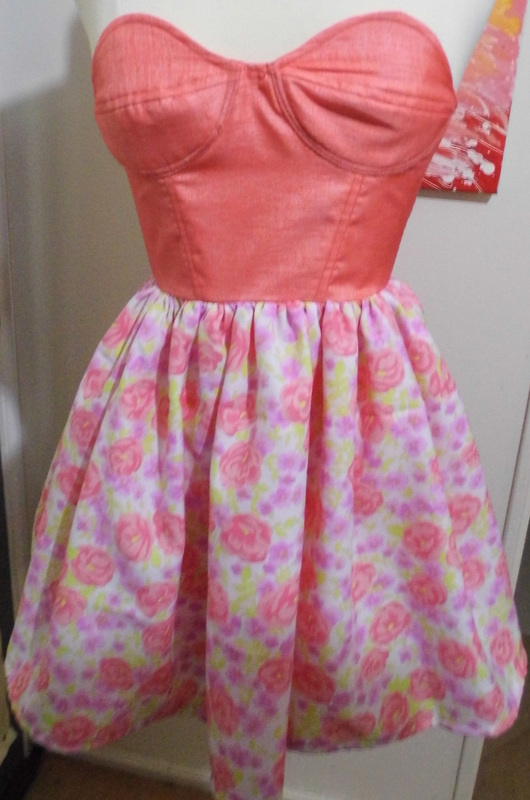 It is a Strapless Floral dress “Cup Size B Bust” with boned structure. 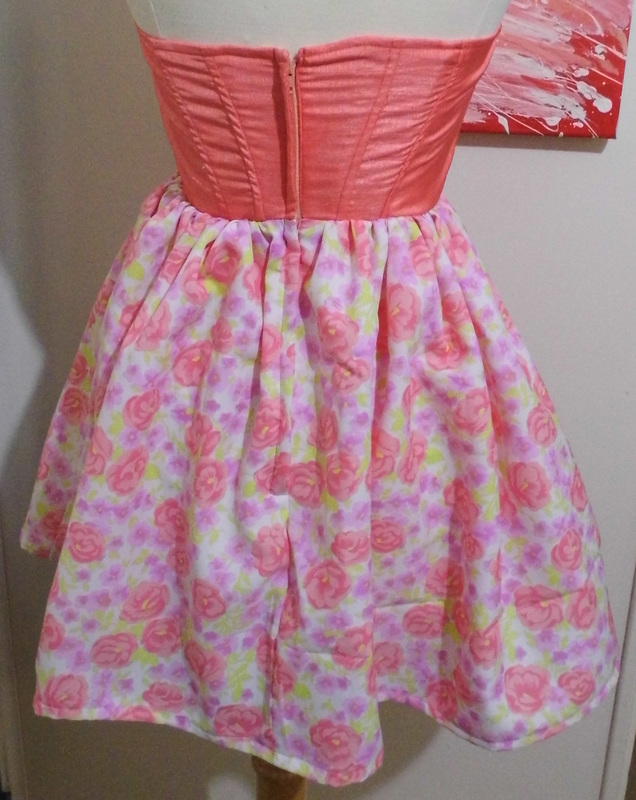 The skirt is a lovely crepe which is gathered to the bodice at the waist. The bodice is made of a polyester. This is design 7 of Secret Cultures 50 designs in 50 days challenge!If you like what you see follow this blog to find out what will be tomorrows design! Here we have a short and seductive size small emerald green slip suitable for sleeping in and wearing around the house.The satin fabric is soft and silky making it feel lovely on your skin.There are two lace bows embellishing the front emphasising your femininity and just making you look so cute as well. 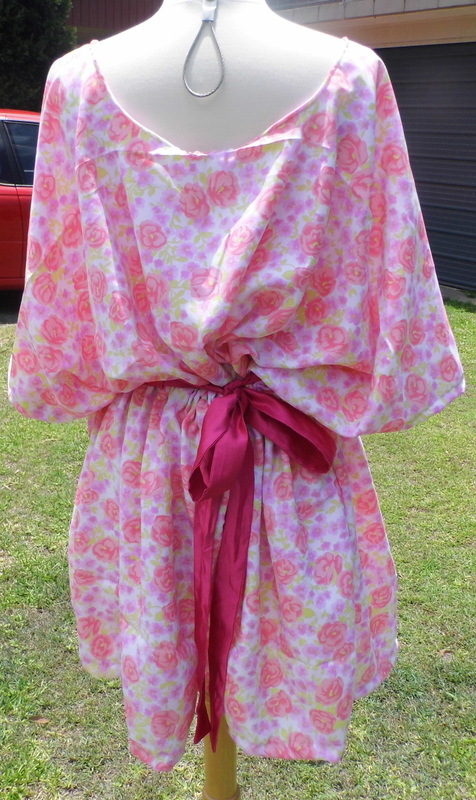 Here we have a lovely pink floral dress that has an elasticated waist. 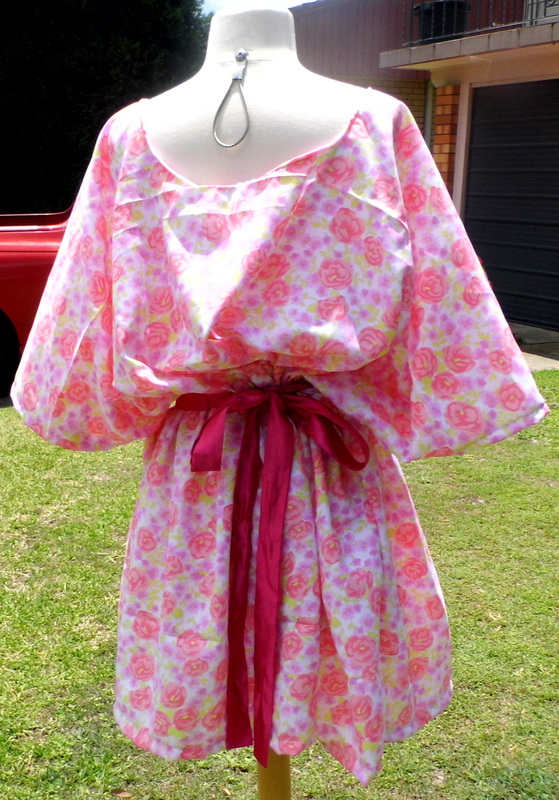 I have added a bright pink vintage satin belt at the waist to accentuate your womanly figure. It has a very pretty feminine floral pattern. It is made with a crepe fabric that has a very slight sheerness about it. Although not sheer enough to reveal your underwear. This is suitable for wearing to the beach or around the house. The qualities of the fabric make it very comfortable. The sun dress has been sewn in rasant thread which is very good quality and will ensure the longevity of your garment. 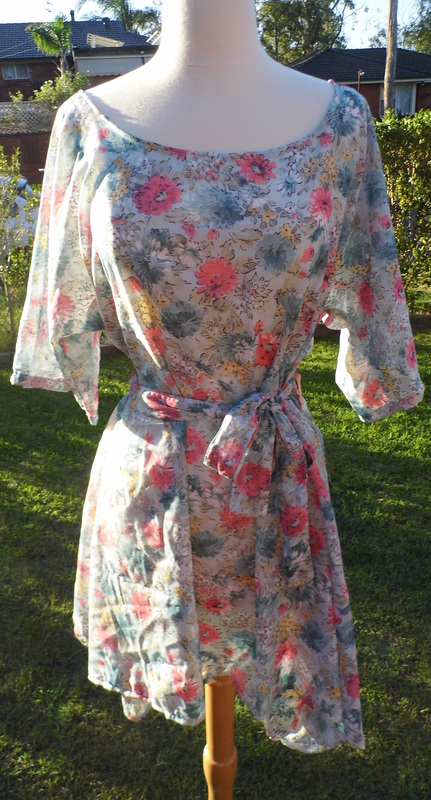 Here we have a lovely floral Sun dress/Kaftan that is belted at the waist to accentuate your womanly curves. It has a very pretty feminine floral pattern. It is made with a light weight sheer Cotton fabric that is suitable for wearing to the beach or around the house. The qualities of the fabric make it very comfortable. The size of the garment means it is suitable for any size up to a 14 and the waist belt should be tied to suit your personal fit. 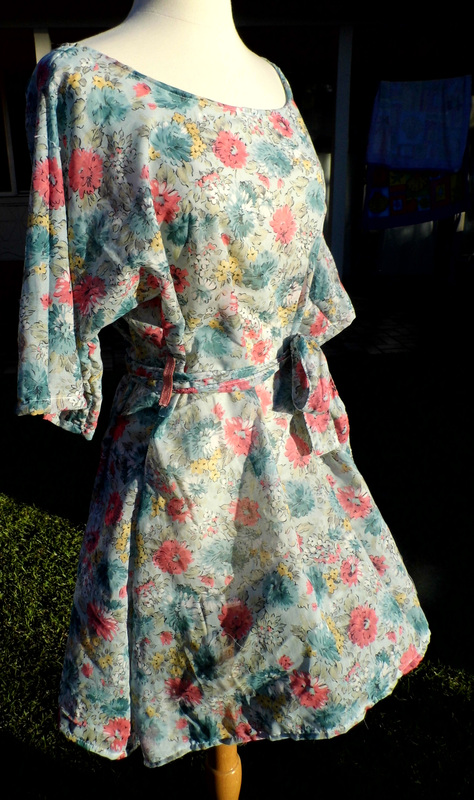 This is a One Off and is made in Vintage fabric. The design will not be mass produced in this fabric in the future as there are limited amounts of this fabric available…..and I have already planned to make a dress with what I have left over. I just had this fantastic idea!!!!!!! For a bit of fun and to help me get motivated in designing again on a competitive level and also to fill my design store on ETSY and EBAY with Secret Culture Designer dresses and so fourth I have come up with the idea 50 designs in 50 days. 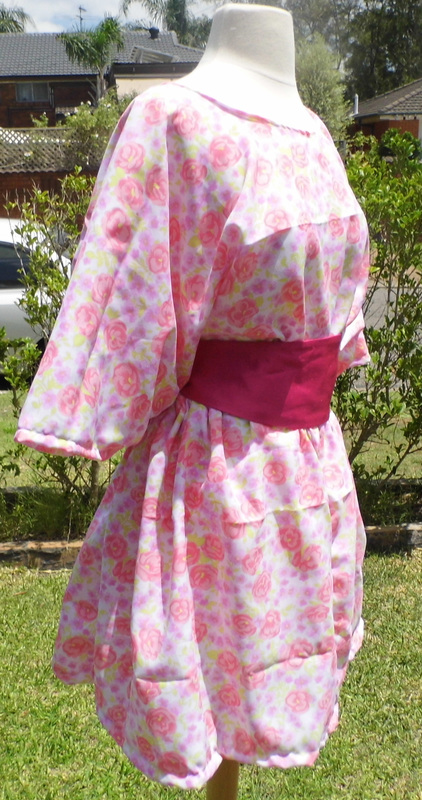 Each day I will design a one off garment or outfit pattern made and entirely sewn by myself. Each piece I will then blog about and also I will upload a photograph of the finished garment on a mannequin or model and link it to my ETSY and EBAY store so that you can especially buy the piece that you are interested in. Sooooooooooooo excited that I have the designer bug already so lets call this day one shall we:)I will be back!!!!!! I hate the fact that fashion exists-The endless waste created by mass production and especially the outsourcing to countries with lower regulatory standards but that doesn’t stop me studying the course.To me the name Fashion is just a name and a way to discover things that I couldn’t learn from my mother who has worked in the industry in factories when they existed in Australia.They are still here but I think it is unlikely you might only be paid 50 cents for a shirt-maker dress nowadays in Australia although you never know.I mean I worked for Suboo a supposed high fashion swimwear label as an intern for nothing(clothes were really made with poor quality control and sold for ridiculous prices).Intern is the equivalent of slave labour with a pretty name.Fashion is the only comprehensive course related to designing your own clothes around.I actually had the argument yesterday with some friends studying the advanced diploma in fashion design.They justified the fact that they could outsource to other countries because of the cheap exchange rates because they have been told that people are paid reasonably in comparison to the country they live in and those people have reasonable conditions in comparison to the country they live in.I gave them a case study to look at .The link for the video is http://www.youtube.com/watch?v=JmZkkYxHaaM&feature=plcp&list=PLA5D40D9AC0E2CF5B which didn’t change their mind and rather made them outraged.The truth is to be a Fashion Designer as I have been trained to be you have to decide between your own moral judgement or justify your actions.With cheap imports and so many other designers and large corporations you hit a major moral dilemma.To mass produce or not to mass produce. To outsource to another country or to have your product made here.I personally am in a situation where I could easily import from India a mass produced product allowing me to break into the market and reach my target market successfully. To become successful in my industry that is what you do to get to the top.I personally would like to mass produce and outsource to another country in the future.The way I go about it I am hoping will be different to other designers.I could not live with myself if I allowed myself to just call a factory overseas or email them and then get my products made.I want to own the factory and pay the workers straight into their bank account.I want to ensure my workers are protected from abuse and mistreatment.Have appropriate baby minding facilities in the factory.A school education supplied and scholarships for further study for the children of the women who work in the factory.Appropriate living arrangements that are not just conditioned on what is appropriate to that country.Whole family health facilities. Training programs and wages that are better than reasonable.The management who run the factory while I am not in India will be continuously tested to ensure that there is no corruption and that standards are maintained.That is just one of my ideas on how to change the world in fashion.It makes me so sad to see videos of people that have worked and lived in such terrible conditions.My father and brother recently went to China and wanted to buy jackets because they were so cold (one for my mother was a dolce and gabbana jacket which I am pretty sure is not counterfeit).My father and brother were amused to see Chinese factory workers living in the boxes with the fur jackets that they have made to send overseas to us.These people are forced to live in boxes so that we can wear that new faux fur jacket.I could never live with myself but so many designers do. They are taught that certain standards are in place and certain Government regulations because if they weren’t taught this these large companies and the whole Fashion industry would have to reassess and rethink how things are done.The fact is the regulations are there but the factories and management are the people who decide what standards are adhered to.That is why I have already started thinking because one day people are going to have to stop ignoring the harm the fashion industry is causing. Not just to countries with the ability to supply poor labour but also to the environment everywhere. I do not know the actual percentage of which landfill is textiles, clothing and footwear and we can’t forget related products such as beds and lounges which are all made from textile fibres.Our society might be finding innovations in relation to fashion but are companies actually using these innovations or age old techniques to save wastage of water and fibres.Do the people in the companies care what happens to the lives of the people who work for them in that other country so long as the garments are delivered on time to reach the catwalk and the market.I could talk for hours on this topic but the truth is this is something that effects printmaking aswell. The fashion industry uses the techniques of printmaking so commonly and in such repetition that having your work printed overseas by a machine or a small child is something not unheard of.Ofcourse with printmaking there are quite reasonable businesses in Sydney and around Australia that will print your design on a shirt. For the larger companies they would still rather send it straight overseas to cut costs. Look at Bonds factory for example. They packed up and moved out of Sydney around 5 years ago overseas.I was lucky enough to walk through twice in high school and it was an eye opener.Even in Australia the standard of that factory was poor.There were gigantic cracks in the floor. Rat baits everywhere. It was cold and wet in some rooms and then almost dusty in the spinning rooms and knitting rooms.In the main designer offices where products are sold it was lovely and clean which has sort of stuck with me. I guess it is the personal note of seeing how factories actually work and knowing my mother worked in many in her time that made it hit home. Designers and management in large companies and even small business have the chance to change the way workers at the bottom of the fashion tree are treated.I will leave you with a video of an exceptional factory to think about. . This amused me because all the women seem to be wearing their best saris and the floor is spotless. This is the clean image that designers imagine when they are purchasing via email or phone.If you actually went to the factory would it look like this?Would these people be getting paid right?